I had never even considered the possibility climate could be affecting Red’s health, until recent events. 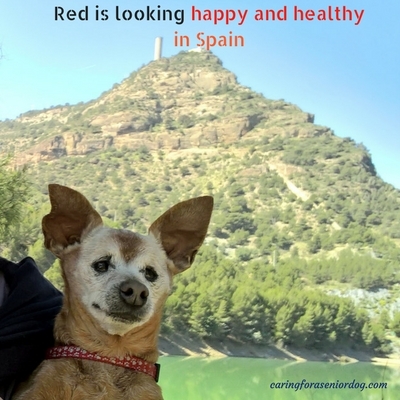 You may know my senior dog Red has some health issues, and you also may know we recently returned to England after spending four months in Spain. While in Spain I took her to a holistic vet named Pepe, who is amazing!! Prior to going to Spain she would get bouts of diarrhea, eye infections and some breathing problems. Each requiring drugs and more drugs. Do you know she didn’t have one problem the entire time we were away! I would say within a couple of weeks of being back I started noticing a bit of puss in her eyes. After three weeks she started with some breathing issues. The first episode happened a few days ago at 4:30 in the morning, enough to scare the living daylights out of me. Thankfully it’s only happened a couple of times, but of course I took her straight to the vet that day. He recommended a heart scan, and today we had it done. More on that later. Can the British climate be the culprit? apart.” Okay a slight exaggeration but you know what I mean. When I told my vet the other day that Red did not have one problem while away, he was stunned and that’s how the conversation turned to climate. Being from Canada I noticed immediately it is a damp type of cold here. In Spain we lived in a quiet area, not a lot of traffic, right near the olive groves with much drier air. My vet told me when he goes home (he’s not from England), he has to use an inhaler, but here he doesn’t and the same can be true for Red, only in reverse. I admit that entire day I walked around muttering how I couldn’t believe climate could affect a dog’s health. I was fascinated by the concept. The whole point of me seeing a holistic vet was to experience a kinder, gentler approach to Red’s care, and of course to try and get her off at least some of the many drugs she was taking. I managed to accomplish both, and now that we’re back she’s already taking one of the medications she didn’t need in Spain. I am back from the heart scan and the good news is, there was no real bad news…at least not any “new” bad news. I was hoping to get some pictures of Red having it done, but since he does it in the dark it wasn’t possible. problem. The medication she’s back on should help, but back to Spain would be better. We’re probably going to Canada for a few weeks so I’m happy to know her heart and lung issues won’t affect her ability to fly. It’s not damp there so it will be interesting to see how she gets on. 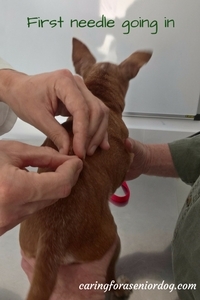 I’m planning on finding a holistic vet and re-starting her acupuncture treatments. Given my recent experience I definitely say yes, and my vet thinks so as well. I wouldn’t say it’s an issue unique to senior dogs though. Does any of this sound familiar? I’d be interested to hear if this has happened to your dog, what it was and how you resolved it. 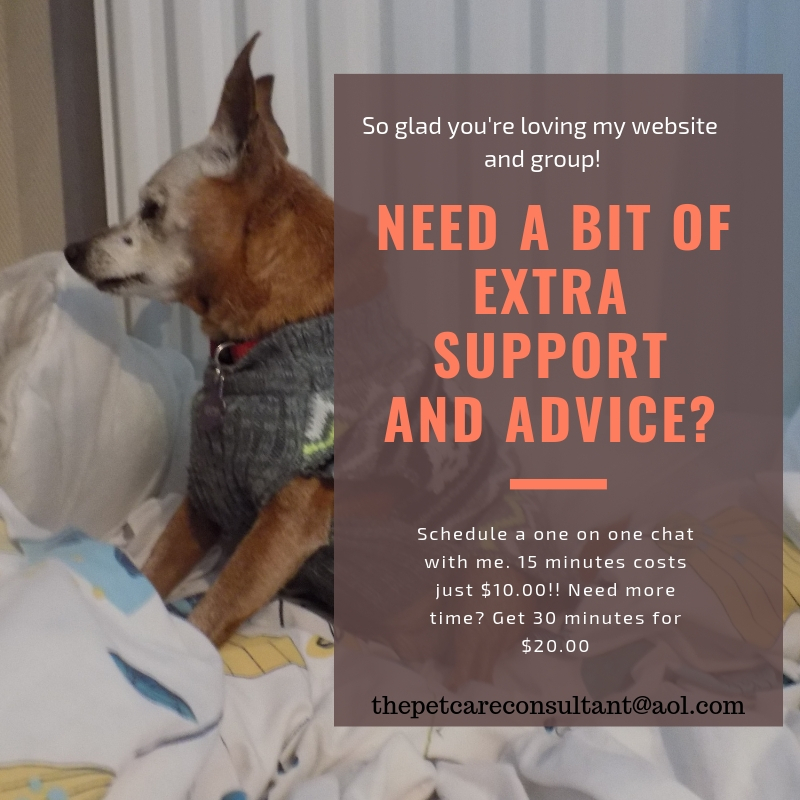 Leave a comment below or on my senior dog Facebook page. I have to agree with you that climate and environment can and does affect not only our pets health but ours as well. I’m so happy to hear that there was no “bad” news from the results of the heart scan. Where in Canada are you visiting?? Hi Kelly, you always hear people moving to places like Arizona, but I had never considered the effect climate would have on animals’ health. Red does have heart issues, but nothing new that was bad, so thank goodness for that. I’m from Montreal but lived in Toronto for 13 years. Mom is still in Montreal, other family in Toronto so I will be going there at some point, not sure when or for how long. Where do you live? 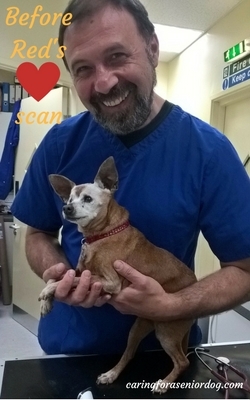 Thank you for your work with senior dogs! I’m sure that climate can affect their health and contribute to varying degrees of inflammation. Can you take her as a “carry-on” on the flight? Good luck with your travel plans!! Thanks Amy, nice of you to say. I hadn’t realised how much it can affect health, and it doesn’t look like only Red is affected. Jack has been scratching like crazy, and the only thing that’s changed is we’re back home!! You can take dogs as carry on depending on airlines and destination. Sadly long haul flights like UK to Canada or US for example, you can’t unless there’s an airline I don’t know about. Awwm poor Red. It does makes sense that the colder, damper climate may be affecting her, I wonder if maybe she has environmental allergies of some sort too? Climate can greaty affect humans and their health, so why not dogs? It makes sense I guess, but I can’t imagine how hard it must be to see Red go “backwards” now that she’s home. Hopefully being back on her medicine helps, even though it stinks that she needs it again. Oh, and Canada… hope she does well in Canada. Best wishes and keep us updated! Hi Debbie, I know it seems so obvious now that we’re talking about it. Why shouldn’t climate affect animals like it does people, yet it never ever dawned on me. I don’t feel like she’s going backwards per se, but I do know she was doing better in Spain. Not sure how long I’ll go to Canada for. If it’s only a week she obviously won’t come, if it’s a few weeks/couple of months I’ll bring her. Who knows I’m so undecided!! We didn’t have our dogs when we lived in England so, I don’t know how my guys would be affected by the damp. Recently, we travelled to Florida. It was similar in humidity to Canada (we are in Ontario) but it was a quick change for them from cold to hot! Henry definitely seemed more mobile in the warm. she used to love to sit outside in the sun when we were there, and funny enough Jack prefers the cold, he just cannot handle the heat. Aw man, poor Red. I wouldn’t have considered environmental/climate as something that would affect my pet’s health, but it makes sense. After all, it can certainly affect our health too! That’s a shame though, after her improving some much, that now she’s backsliding because of the climate. I hope that the Canadian environment will be better for her! I know I never would have guessed. She’s still doing well, it’s just she was doing better. Not sure she’ll be going to Canada, depends on how long I’ll be there. Such long flights and so much hassle I don’t think I want to put any of us through that. This is so interesting! I’m sorry Red isn’t feeling well now that you’re back home. I think climate can effect any person or dog’s health. When we moved to Phoenix my cats arthritis was much better & my asthma all but disappeared! The dry weather worked wonders. I think the damp NY weather may be effecting Phoebe’s respiratory system. Thanks Cathy. It’s incredible how much it not only helped you but your pets as well. Sounds like Phoebe would like to be in Phoenix!! I told my vet he needed to write a prescription for Red, saying the medication is to go back to Spain. I absolutely agree. The humidity always had a negative impact on dog Pip’s breathing and heart issues. The cold damp winter also effected his arthritis. I hope he does well in Canada! Everyone is sharing their experiences of the impact climate has/had on their pets. It seems like I’m the only one that never thought of it!! I guess because she was fine when we were in Florida, and problems started cropping up over the years in England. I assumed the issues were aging, and that was that. Only one we went to Spain then came back did I notice a difference. I truly know climate can affect a dog. When we traveled to the southwestern part of the US with our Cocker, his allergies flared big time. I am glad that we prepared and this is the type of post to call attention to a very important topic. Thanks for addressing it. I am sharing. Hi Carol, Am I the only clueless pet parent when it comes to climate? It’s fortunate you knew of his allergies and were prepared. Although Red is originally from Florida, she’s spent most of her life with me in England, except for the odd trip to Canada. Only once we came back from so many months in Spain, and treatment by a holistic vet, were the changes glaringly obvious. Thanks very much for sharing, I appreciate that. Great post. Absolutely! And in so many ways. 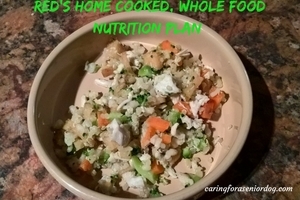 Just for an average, healthy dog, the temperature can determine what foods to feed. In summer, it’s hot, so I feed Dexter foods that are cooling. In winter, the opposite. With his neurological condition, barometer changes affect his pain. Hugs to Red. Thank you Tonya. That’s an interesting point you make about feeding Dexter according to the weather, I imagine it helps him a lot. Poor sweetie, and I can related to changes in barometric pressure. The odd time I will get dizzy (thankfully it’s rare) and I know it means the pressure is dropping suddenly. What do you do for his pain in those cases? Right now I have a med on hand, I try to use some herbs and calming spray if I can get away with it.